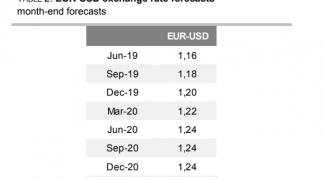 EUR/USD Recovery in Prospect after ZEW Index Surges in March? The Euro could be on course for recovery after an influential survey of sentiment showed on Tuesday, Eurozone investment professionals becoming much less pessimistic about the outlook for the single currency bloc's economy. A respected leading indicator of sentiment in the European Union has shown a strong rebound in March that could foreshadow a comparable recovery in data measuring actual economic output, with a positive knock-on effect for the Euro. The ZEW investor sentiment index showed a dramatic rebound in confidence about the six-month economic outlook in March, although respondents were less optimistic about the ‘current situation’ component of the index. The forward-looking ‘expectations’ index jumped by 14.1 points in the Eurozone to a balance of -2.5. In Germany the index rose 9.8 points to -3.6. 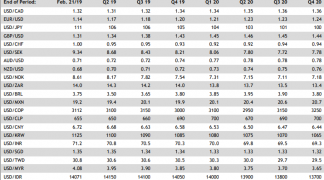 However, and on the downside, the ‘current situation’ sub-index fell -3.6 points to -6.6 for the Eurozone, and by -3.9 points to 11.1 for Germany. The ZEW is a German survey that asks 300 financial experts for their opinions on various questions relating to the markets and economy. The improvement in the future outlook was attributed to hopes of a deal that ends the U.S.-China trade war and the improving odds of a delay to the Brexit process. Above: March ZEW survey results. Above: Correlation between ZEW and Ifo survey indices. The Euro was little changed after the release. One explanation for the lack of upside may be technical, since chartists have highlighted that the EUR/USD pair is a approaching a pocket of tough resistance on the charts. "EUR/USD is approaching tougher resistance at the 55 and 100 day ma at 1.1364/66 and we would allow for initial failure and some slippage back to the low 1.1300 region. We have our doubts that the market will at this juncture retest the 61.8% Fibonacci retracement of the 2017-18 advance at 1.1186 and suspect that this may be a falling wedge (bullish formation) developing," says Karen Jones, head of technical analysis at Commerzbank. Jones' charts show why bulls may exercise caution in the short-term as key resistance levels obstruct progress, but her medium-term view is actually more bullish and foresees an eventual breakout from a ‘bullish wedge’ pattern leading to substantial upside. Above: Commerzbank analysis of EUR/USD pair. Other data released at the start of the new week was less positive than Tuesday's ZEW survey. Growth in Eurozone labour costs disappointed economists this week, which is negative for the inflation outlook. It is the moribund outlook for inflation that has led the European Central Bank to recently give up hope of being able to lift its interest rate at some point later in 2019. London-based consultancy Capital Economics says inflation will not rise sufficiently enough to trigger rate hikes from the ECB for a while yet. “We do not share the ECB’s optimism about wage growth or, in turn, core inflation. So we think that it will have to keep monetary policy extremely loose, and ultimately re-start its quantitative easing programme next year,” says Jack Allen, senior European economist at Capital Economics. 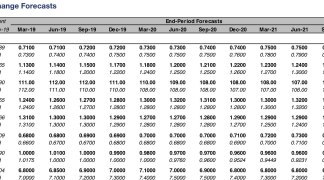 Dampened interest rate expectations are a headwind for the Euro since interest rates are a major driver of foreign capital inflows and therefore local currency demand. Foreign investors tend to favour to send and keep their money where it can earn the greatest returns. "With major fiscal policy easing not under consideration (despite being the obvious cure for the current economic weakness,) with Brexit uncertainty continuing and with the ECB hamstrung, the euro can't get much joy from lower US bond yields and the danger of weaker US growth," says Kit Juckes, chief FX strategist at Societe Generale. "Upside is only on offer when growth prospects improve and Bund yields rise." The Euro is facing multiple headwinds that have darkened its outlook, leading investors to shun the currency in their droves during recent weeks, but the weekend ahead is offering up a series of event risks that could easily weigh on the currency Monday. The Euro broke decisively through the floor of a seven-month trading range overnight, hitting a fresh 22-month low in the process, and analysts at a number of major banks are warning that this could mean further losses are in the pipeline. The Euro was under the thumb of a resurgent Dollar Wednesday after the latest Ifo Institute for Economic Research survey showed German companies becoming more pessimistic about their current business situation and future prospects, reversing some of the minor improvement seen back in March.